Gov. Mike Parson hopes to focus the 2019 legislative session on workfoce development and road improvement. Parson has been laser focused on two big initiatives: improving Missouri’s workforce development and improving roads and bridges. But actually getting money for these goals is easier said than done, especially since the state’s revenue situation is shaky — as budget leaders only expect around 2 percent growth for the year. St. Louis Public Radio's Jason Rosenbaum previews the 2019 legislative session. Members of both parties appear primed to go after a new system to draw state legislative districts, a move that would require a statewide vote to actually accomplish. And Republicans, in particular, appear ready to make it more difficult to get initiative petitions off the ground. All of this makes for what is expected to be an impactful session. And Parson says he’s ready to be in the mix. How much does a dollar cost? One aspect of Parson’s workforce-development agenda is expanding the state’s role in early childhood education. While Missouri does assist local districts with preschool, it’s not a significant enough amount to expand any programs. Figuring out a plan to drum up more money for transportation projects may be trickier. Voters rejected a gas-tax increase last year, roughly four years after defeating a sales-tax hike. Still, Parson isn’t giving up on the issue. Lawmakers may be pressed to make changes to the state low-income housing tax-credit program, which Greitens froze in 2017. Even though Parson is on the record supporting the incentive, he’s indicated that he’s not going to push his appointees on the Missouri Housing Development Commission to restart the credit without changes. "I really believe working with the legislators, leadership, the industry, we’ve said ‘look, this has got to happen,’" Parson said. "And I’ve been around long enough in the legislature to know how it works: Stall, stall, stall to the last. And we say ‘whoop, we ran out of time.’ That’s not going to happen. I’ve been pretty open with everybody: We are not going to issue those low income taxes until we have reform to that program." While Parson has said he’s confident that lawmakers could push through substantive changes, that may be easier said than done. Efforts to curtail the low-income housing tax credit have been stymied in the past, most notably in a disastrous 2011 special session. Parson isn’t the only new leader on the scene for the 2019 legislative session. House Speaker Elijah Haahr, R-Springfield, and Senate President Pro Tem-elect Dave Schatz, R-Sullivan, were picked by their GOP colleagues to lead the House and Senate. While Senate Minority Leader Gina Walsh, D-Bellefontaine Neighbors, is returning for another two-year term, House Minority Leader Crystal Quade, D-Springfield, will be the new leader of the House Democrats. Haahr and Quade are the first millennials to lead a GOP or Democratic caucus in Missouri. More often than not, Republicans have had a tougher time passing big-ticket items through the Missouri Senate — where any lawmaker can filibuster legislation. It’s not out of that question that Schatz may face some difficulties from a group of more conservative-minded lawmakers that could chafe against GOP leadership. But Schatz emphasized that he wants to make sure every member of his caucus is able to play a role in moving the GOP agenda forward. He also said that turnover in members could have a tangible impact on policy, most notably with efforts to pass a prescription-drug-monitoring program. With drug-monitoring critic Rob Schaaf’s departure from the Senate, Schatz is optimistic that there could finally be movement on the program aimed at stemming the opioid epidemic. Both Secretary of State Jay Ashcroft and a number of GOP lawmakers have expressed support for overhauling the initiative petition process. 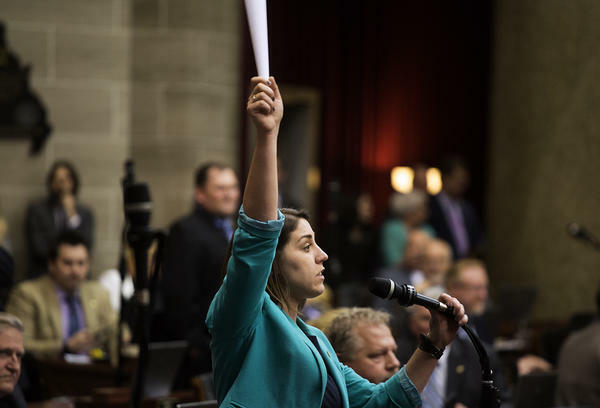 This push comes after Missourians approved a minimum-wage increase, the legalization of medical marijuana and major changes to state legislative redistricting. Burlison, for instance, has proposed a measure that would require more signatures to get something on the ballot. It would also mandate that a constitutional amendment receive two-thirds of the vote before going into effect instead of the current simple majority. The proposed constitutional amendment would require statewide approval to go into effect. “To me, if you’re going to change the constitution — you’re going to get the whole state in agreement,” he said. Members of both parties may take aim at a new redistricting system, widely known as Clean Missouri. It would place much of the responsibility for creating state House and Senate districts in the hands of a demographer, who would have to draw lines based on partisan fairness and competitiveness. Any change to Clean Missouri would require another statewide vote. Republicans have contended the new system is designed to give Democrats a leg up on the redistricting process. And some African-American lawmakers believe the changes will spread black voters out into suburban or rural districts, making it more difficult to get elected. “After what has happened in St. Louis County and the state of Missouri, I cannot by any means give up the opportunity for African-Americans to represent other minorities,” said state Rep.-elect Maria Chappelle-Nadal, D-University City. Clean Missouri proponents have pointed to language in the amendment aimed at protecting minority representation. They've also emphasized that the measure, which passed by more than 60 percent of the vote, was popular in every corner of the state. Both Quade and Walsh have stressed that they want to prevent the Legislature from overturning voter-approved initiatives. GOP lawmakers may be less inclined to pass right to work, which bars unions and employers from requiring workers to pay dues. Voters repealed that measure last year by a huge margin. While Burlison has proposed legislation to reinstate right to work, neither Schatz nor Parson indicated that the policy was a priority. And Schatz said it was unlikely that right to work will get much traction — even though he supports the idea.